Nikola Mirotic – Copyright 2019 NBAE (Photo by Nathaniel S. Butler/NBAE via Getty Images). More injury issues for the Milwaukee Bucks as the regular season winds down. 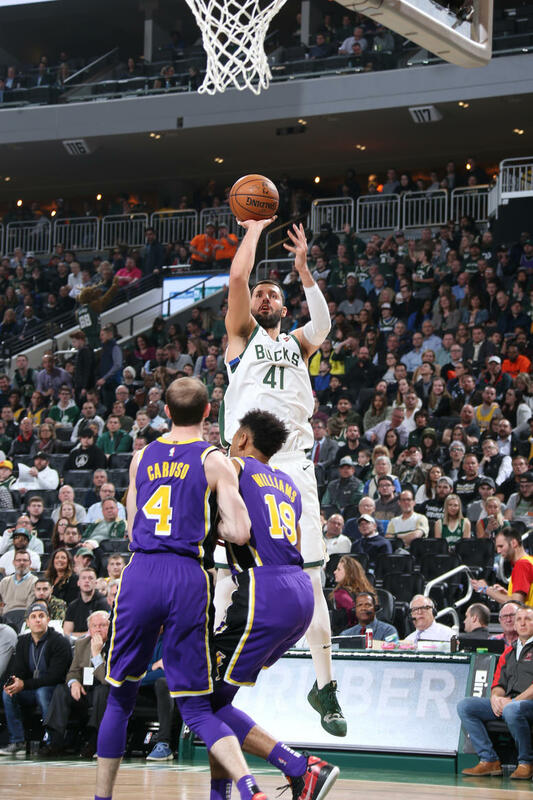 Forward Nikola Mirotic is the latest casualty for the Bucks after suffering a sprained and fractured left thumb in Tuesday nights win over the Los Angeles Lakers at Fiserv Forum. The injury is expected to keep Mirotic sidelined for two to four weeks. The playoffs start in 3 1/2 weeks in mid-April. Since being acquired by the Bucks on Feb. 7, Mirotic has played in 14 games (three starts) and is averaging 11.6 points, 5.4 rebounds and 1.4 assists in 22.9 minutes a game. Five other Bucks are listed as out for Wednesday nights game in Cleveland. Malcolm Brogdon (foot), Sterling Brown (right wrist soreness), Donte DiVincenzo (heel bursitis), Pau Gasol (ankle) and George Hill (groin soreness). Giannis Antetokounmpo is questionable for tonight’s game. He sat out last night’s win against the Lakers with a right ankle sprain. Ersan Ilyasova is also probable after missing Tuesday’s game with an illness. The Bucks can claim its first Central Division title since 2001 with a win tonight. They start the day three games in front of Toronto for the top spot in the Eastern Conference with 11 games left in the regular season. 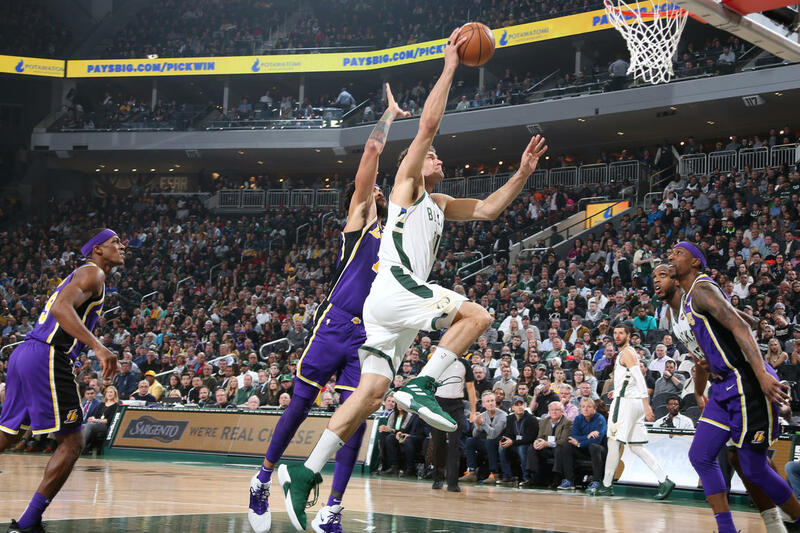 Milwaukee Bucks forward Ersan Ilyasova underwent successful surgery on Friday to repair a fractured nose, which he sustained during practice on Dec. 16. The surgery was performed by Dr. Sachin Pawar of the Froedtert & Medical College of Wisconsin health network under the supervision of Bucks team physician Dr. William Raasch. Ilyasova will remain out and his status will be updated as appropriate. In 24 games (two starts) for the Bucks this season, Ilyasova is averaging 7.5 points, 5.5 rebounds and 1.2 assists in 19.9 minutes per game while shooting 43.0 percent from the field. With Giannis Antetokounmpo in the teams concussion protocol, the Milwaukee Bucks knocked off the Toronto Raptors 124-109 in a battle of the league’s final two unbeaten at Fiserv Forum on Monday night. Ersan Ilyasova led the way with 19 points and 10 rebounds, one of seven Bucks to score in double figures on the night. Eric Bledsoe and Malcolm Brogdon added 17 points apiece. Khris Middleton, after a slow start, finished with 14 points and Donte DiVincenzo added a dozen and the Bucks tied their franchise record with 19 triples (19 of 45) for the game. Thon Makers minutes increased with Antetokounmpo sidelined. He finished with 11 points. The Bucks are off until Thursday night when they put their 7-0 record up against the Celtics in Boston. The Milwaukee Bucks jumped out to a big lead in the first half, then went cold in the second half but managed to pull out a 113-112 win over the Charlotte Hornets in the regular season opener in Charlotte. The Bucks led by as many as 20 points, but things got sloppy in the second half. They turned it over 21 times, eight of them by Giannis Antetokounmpo, who found himself dealing with foul trouble in the opener. After the Bucks coughed up the lead, Antetokounmpo made a pair of free throws with 24.5 seconds to retake the lead. Ersan Ilyasova is returning to the Milwaukee Bucks for a third time, agreeing to a three-year deal worth $21 million. The third year of the deal is not guaranteed according to a Journal Sentinel report. Ilyasova was originally drafted by the Bucks in 2005. Mike Budenholzer will be his seventh different head coach in Milwaukee, although Ilyasova played for the new Bucks coach in Atlanta. Ilyasova split last season with the Atlanta Hawks and Philadelphia 76ers, averaging 10.9 points and 5.9 rebounds per game. He is a career 36.6% three-point shooter. The Bucks roster currently stands at 14 players. The Milwaukee Bucks pulled off a deal today in what is believed to be a move to create salary cap space. 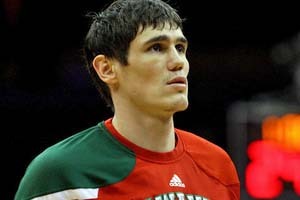 The Bucks sent veteran forward Ersan Ilyasova to the Detroit Pistons for forwards Caron Butler and Shawne Williams. Butler spent part of the 2013-14 season with the Bucks. He averaged 11 points, 4.6 rebounds and 24.1 minutes in 34 games before being waived on Feb. 27, 2014. Butler finished that season with the Oklahoma City Thunder, then signed with Detroit last season. 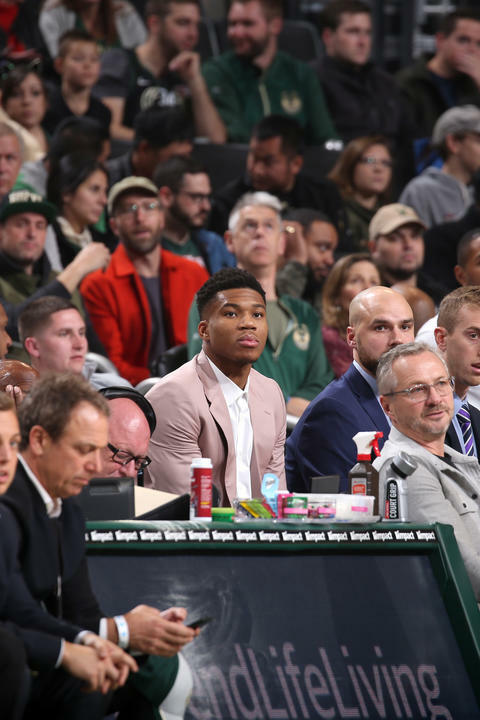 Milwaukee Bucks coach Jason Kidd used his starters very little in the second half, making sure they’re healthy heading into the NBA’s post-season. The Bucks fell to the Boston Celtics 105-100 in the finale, finishing 41-41 on the season. That’s a 26-game improvement from the 15-wins of a year ago. Ersan Ilyasova led Milwaukee with 21 points and Khris Middleton added 18 points. Unfortunately, the Bucks will meet the Chicago Bulls in the opening round of the Eastern Conference playoffs. The Bucks went 1-3 against the Bulls this season but won the last time out, 95-91 on April 1. The biggest thorn in the Bucks side when it comes to the Bulls is Pau Gasol. He scored a career-high 46 points against the Bucks during a game in January. 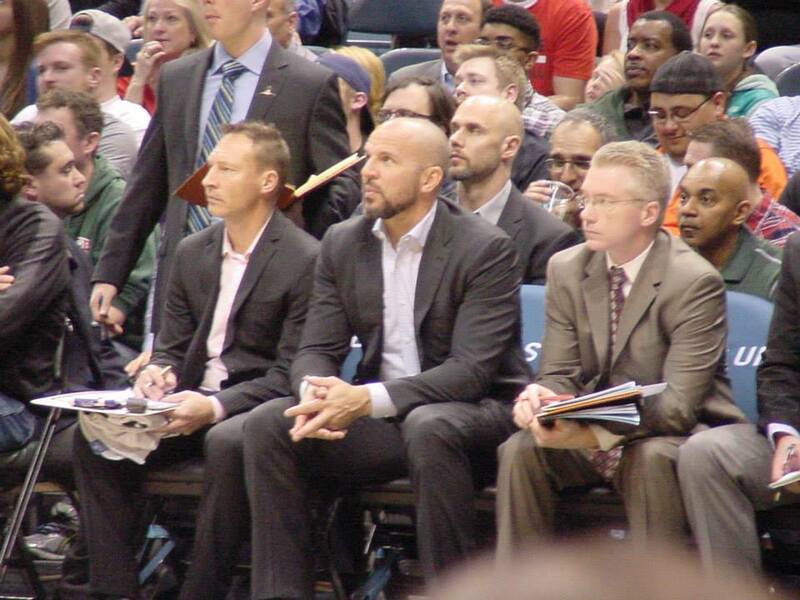 The Bucks went 11-18 since the all-star break but coach Jason Kidd said it’s still a great start for the Bucks. 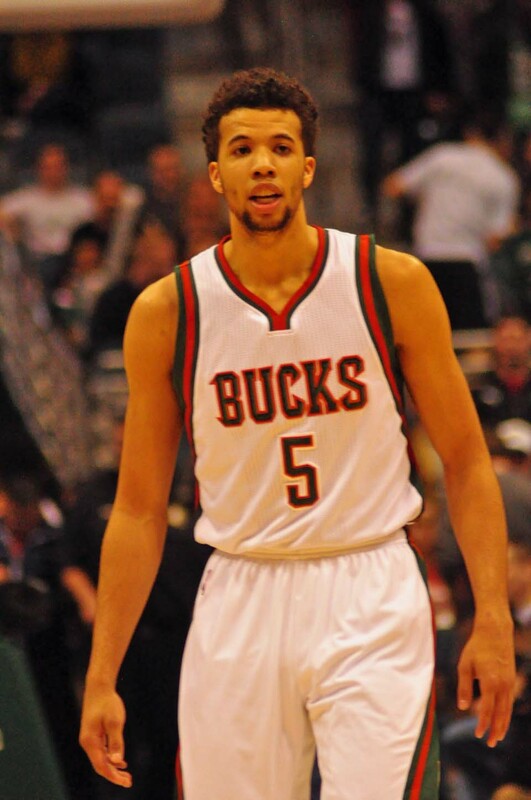 Michael Carter-Williams led his new team to a victory over his old team last night as the Milwaukee Bucks knocked off the Philadelphia 76ers in Philadelphia 107-97. Carter-Williams poured in 30-points against his old team, just three points shy of his career mark. He finished 11 of 17 from the field and hit 13 free throws. It’s the 41st win of the season for the Bucks (41-40) who guaranteed they will finish the season no worse than .500. That, after winning just 15-games all of last season. The Bucks will close out the regular season at home on Wednesday night against the Boston Celtics. Ersan Ilyasova and O.J. Mayo had 13 points and Giannis Antetokounmpo added 12 points in the Bucks victory. The Milwaukee Bucks clinched a playoff spot on Sunday with a 96-73 win over the Brooklyn Nets at the BMO Harris Bradley Center. 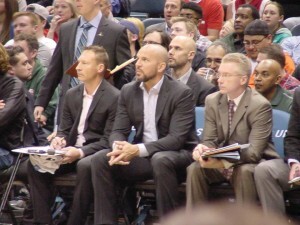 The Bucks also clinched the sixth seed in the Eastern Conference, one year after the Bucks won an NBA worst 15-games. Ersan Ilyasova had 21 points and O.J. Mayo added 17 for the Bucks, who will likely face either Toronto or Chicago in the first round of the NBA playoffs.